My question is if the Jelly Belly people are soooo good at getting flavors right, why is everyone else so pedestrian? Oh are they the only company allllllooOOOOWED to make candy that tastes like the things they SAY they taste like? Does Jelly Belly have a patent on candy with true-to-real flavors? Because here I am again reviewing Jelly Belly and trotting out some similar verse: these jelly beans taste like what they say they taste like. In this case, Tabasco. However, is that a good thing? We can agree spicy candy is in. I wouldn’t call it “all the rage” but I would say there are more spicy types of candy now than I ever remember as a kid. It used to be Red Hots, Big Red gum, perhaps an Atomic Fireball or 2, along with the requisite Hot Tamales – and that was it if you wanted heat, and all of that was cinnamon-based. But now…please. You got Sriracha lollies for chrissake. Caramels with chile, gummies with intensified ginger, and spicy chocolate — this one made with Tabasco too. These are fun to eat a few at a time. 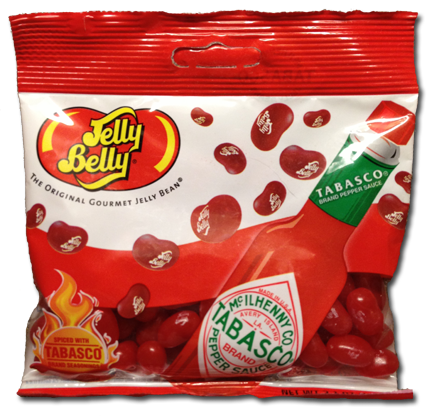 A true novelty candy since Tabasco lovers will genuinely know they are eating the real thing, but these aren’t a sit-down-and-eat-a-whole-package kinda goto sweet — unless you take Jelly Belly’s advice and mix and match other beans with these babies. Go with some of the lime or lemon flavors, citrus stuff, and eat them with the Tabasco beans. Recipe it up. Then you got yourself a sweet and spicy cocktail of goodness. Yumsworth. I agree, these are very Tobasco-y. I actually enjoyed eating them without other flavors, but I get what Matty’s hinting at. 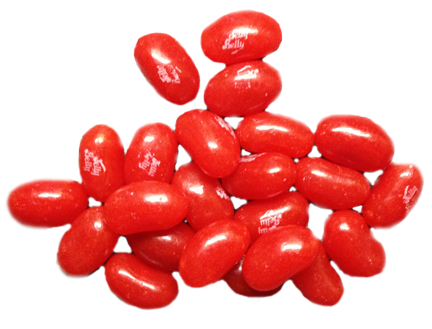 Big props for nailing the flavor, Jelly BellY!